Taking into account the speed of movement of the person has to be perfect . How to implement a ” GPS location ” ? Once the coordinates of the character is not tied to Lat – Lon coordinates. Sorry my bad English. 2)Convert it to meters (in Mercator), subtract central tile position (in meters) from that. This should yield the player position in unity space. Hi great work with the stuff that you are doing, congrats on your new job, hope you are doing fine, just wanted to know how to find the central tile as you mention, is there a script object, or is there more code that i need to write? You can find central tile information under TileManager (and derived classes). Tile manager has CenterTms and CenterInMercator for example but they are protected so you’ll have to make them public or add support functions if you want to use them from outside. I know this is an old post, but I’m kinda stuck on this part. I want to retrieve long/latitudes of GameObjects so I can reposition them to the right tile/unityposition when changing zoomlevels. You’re saying this should be done by “querying the LocationInfo class”. I see the Unity class, but not sure what you mean in how to use this. Have you tried Mapbox SDK though? You’ll probably find it much easier to work with. It’s a more complete solution and supported much better of course. very helpful! You will use the GPS positioning? Thanks! I’ll do a post on GPS, probably next week (or maybe this weekend). But please create a git repository and host it somewhere (either Github or Bitbucket), keeping track of all the packages you created is not a pleasant task. I’ll definitely do that, it’s getting quite painful for me as well. I’ll post it here asap. Cheers! Please do let me know if everything works fine. Hey! I was wondering if you knew a way to track how many kilometers/miles the player has moved on the map? I’m guessing it the data would be needed from the map provider? That should be easy, no need for extra data at all. All I’ll do is track gameobject movement (in 3d world unit) and convert it to km or whatever depending on the current detail level. I’ll have to figure out that last part (conversion function) but shouldn’t be a trouble. And oh, this might be an annoying question, but do you plan on smoothing out the roads? Sometimes when the road is curved, you can see that the quads make up small spaces between eachother. I’m really interested in this project, really great work! It won’t be perfect though, as Mapzen data doesn’t have the concept of intersections. But curves will be there no problem. Could not work on android mobile for the version built by Unity3D? I haven’t tested it on mobile and not aiming for that for now. First of all, it should be quite heavy for mobile as every single building is a seperate gameobject. Should merge them into single one for mobile really. Let’s start with that and I’ll move on for other movile compatibility stuff later on. You’re absolutely right on that! I thought it was good enough so didn’t bothered to fix that but yea, gotta do it properly I guess. Guess it’s fixed after that last bug fixes, can you try that please? hi…sorry for my english.you are doing a great work….really….im learning with it.but i think i found a problem….long and lat on mapzen loaded image is not the same as osm image…..im doing something wrong?are the coordinates moved?? 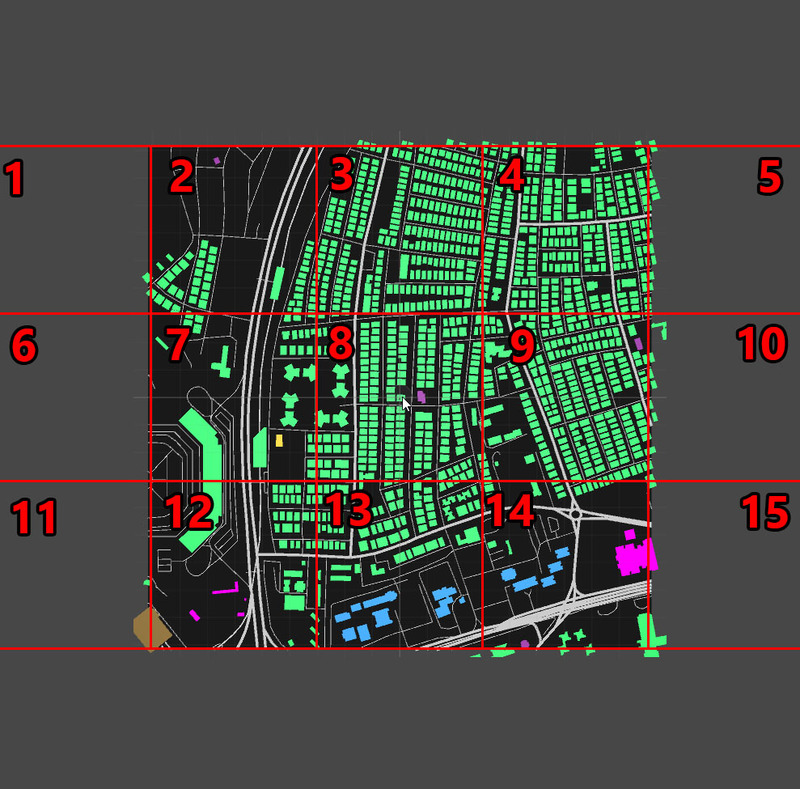 I’m using OpenStreetMap image service in my project already. Can you pull and try the latest version from my Git page please? Been playing about with your project for the past week and have added boundaries and water. Couple of issues I can’t work out though, water seems to contain 4 types of data structures. LineString, MultiLineString, Polygon and MultiPolygon. While the polgon types are straight forward, the LineStrings are a nuisance. I have found that some actually duplicate the location of the polygon information and the MultiLineString makes empty spaces, as in traces the outline of an area. I think you could possibly close the loop on the string by turning it into a polygon if you line up the close on the edge of the tile. Not too sure though? Boundaries was straight forward however I did come across some areas, though very rare, the normals are flipped, I had to create a double sided shader to render both sides of the poly for it to be visible top down and there doesn’t appear to be anything in the geo data to work from. I know it will likely come down to the winding order of when creating the mesh, but still annoying. Double sided shader/material easily fixes it though. First of all, that last thing should be solved now (not tested extensively but still) if you check the latest version from my git page (https://github.com/brnkhy/MapzenGo). I’m also working on water layer at the moment. It’s kinda tricky. I don’t know why but I’ve totally ignored Multi/LineStrings since I started this project. Other than that, there are two core issues, for all layers really; (1) triangulation code fails occasionally, (2) I haven’t looked into polygons with holes yet (building with holes, water with islands etc). You can also check those stuff from “dev” branch (on git), I’ll push it on main once I’m happy with it. I haven’t looked into the boundaries but I also noticed occasional flipped buildings in the past. I believe it might be related to two problems I noted above, triangulator errors or result of not caring about hole (if I recall correctly, holes are represented with counter clockwise (or clockwise? cant remember) polygons. Oh with the boundaries when you start playing about with it, one thing to note is your method of the unique id will not work in some instances. Some boundaries share/occupy the exact same space. For instance, a woodland would have same geo coordinates as a national park. I changed the key to a string for now using X_Y_Z_Type just so I could see it working with all boundaries. I managed to get water layer work I guess, it was an extremely small silly mistake. Now it works quite good as far as I could test. I knew those keys would create all sorts of problems, but it was decent for buildings I guess. Still I believe I know how to fix that, not sure if I pushed that into git or not though. There was a small problem where the json parser I’m using failed to parse ids properly. With that fixed, there is absolutely no reason not to use, unique ids mapzen provide. Ah that might be where I saw the boundaries then, I think when I went to implement it before I assumed boundaries marked out land use and probably got the name still stuck in my head from that. That looks quite nice indeed! I’m not able to check that in Unity right now but that’s probably the intended behaviour. I might be wrong but blue point is probably the center of the current TMS tile. And red is the point you reqested. Tile manager finds the tile containing requested point, then snaps its center to 0,0 as you noted. thanks….then..the long , and lat i request, is not in the center of the tile donloaded?..just a tile with the point in it, the center is not the point i request?…is that? I believe you’re using detail level 16 and the center of that image matches the blue point you posted earlier. thanks brnkhy, i undertand it now….and great work again….thank you very much….i keep learning with you and your project…. I tried to copy the project, but for some reason, some of the roads go up off the ground, or down through it, is that something you know about? I haven’t seen something like that before, can you post a screenshot or something? thx for sharing this, awesome work! I updated the UniRx and package 8.6 above. Can you tried it out and let me know if it’s working for you now? Hi man! Nice posts, i’ve one question: How can i load more than 9 tiles? Hey sorry for the late response (gdc rush ><). All those stuff should be under TileManager classes (and classes inherited fro that), have you checked those?